Summary: This book is a collection of fourteen poems that tells the story of daily life for the American slave. Grady’s poetry and Wood’s artwork describes the pain, grief, misery as well as the unshakeable spirit, love of God, family, faith and most importantly, the hope of black slaves. Literary Elements: The literary style is prose. The setting is the plantation of the American South. The name of each poem (North Star and Log Cabin, for example) is actually the name of a traditional patchwork block. The book is a realistic portrayal of the lives of slaves. The poems are told first person allowing the reader to hear the slave’s voice as in one poem called ‘Underground Railroad’ where a runaway slaves tells he outsmarts the bounty hunter as he escapes to freedom. 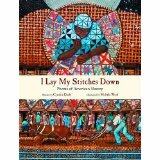 Each poem tells about an aspect of slavery, gives a quilting and spiritual reference. The quilting references may not be obvious to young readers. The illustrations were created with acrylics on canvas. Michele Wood illustrates each poem using traditional patchwork blocks in deep rich hues. We must remember that God does not forget his children who are the victims of evil forces. He gives us the interior resources to bear the burdens and tribulations of life. When we are in the darkness of some oppressive Egypt, God is a light unto our path. He imbues us with the strength needed to endure the ordeals of Egypt, and he gives us the courage and power to undertake the journey ahead. When the lamp of hope flickers and the candle of faith runs low, he restoreth our souls, giving us renewed vigor to carry on. He is with us not only in the noontime of fulfillment, but also in the midnight of despair” (King, Strength to Love, 85). Cynthia Grady captures the presence of evil but also the hope that allowed the American slave and the rest of us to carry on. Based on your reading of the poems, describe what life was like for slaves. Define hope; give examples of hope from the poems in book. In the poem, ‘North Star,’ a six year says, “A body wants to be free.” What does he mean? In our life of faith, what does freedom or being free mean? I Lay My Stitches Down by Storypath is licensed under a Creative Commons Attribution-NonCommercial 4.0 International License.